Until very recently Caff’s reputation rested upon a startling track record of hard trad onsights and flashes; a 30+ tally of E7/8s climbed in the best possible style and seemingly with the minimum of fuss. Caff grew up in Keswick in the Lake District, the son of Ray McHaffie, a prolific climber and renowned upland footpath builder. A climbing life might have seemed the obvious choice, but an early fright put him off the idea. In fact Caff did not start until he was 15 years old, when a happenstance visit to a climbing wall stirred him sufficiently to ask his dad to take him out again. See below for more Cafftastic Stuff! 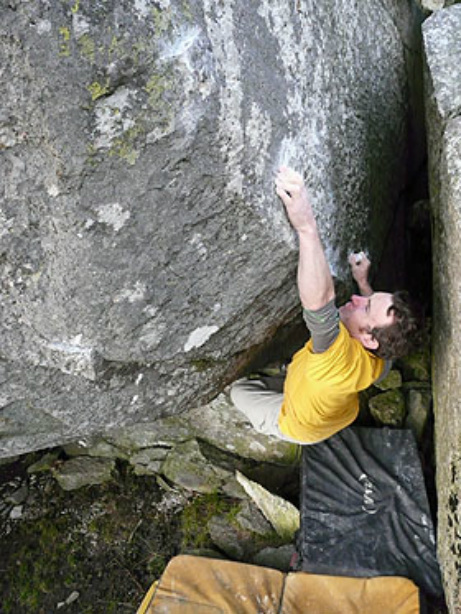 James McHaffie has climbed the long standing slate project The Meltdown to give the UK its hardest slab route at around 9a. See the full story here on UK Climbing. WIN a day climbing with James! just click here for more info. James climbing Mission Impossible - watch the video here!